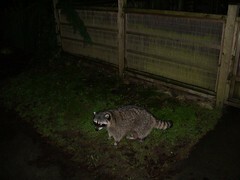 As promised, the picture I took of the raccoon I met yesterday. Oh WOOKITIM!! He's so cute!! You're giving me serious PTSD flashbacks here.